Donut Friend is all about thinking outside of the box. Take, for example, their Srirachosin: a behemoth donut stuffed with peanut butter, strawberry jam, bacon and a few drops of sriracha hot sauce. 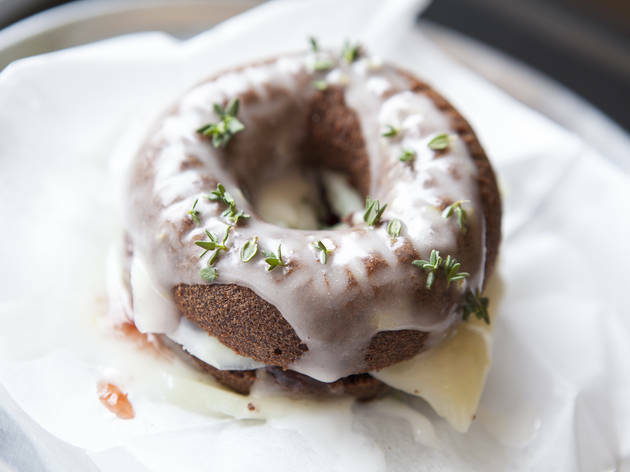 Or perhaps, for a donut with a little more class, the Jets to Basil: a traditional donut filled with goat cheese, jam and a balsamic reduction. 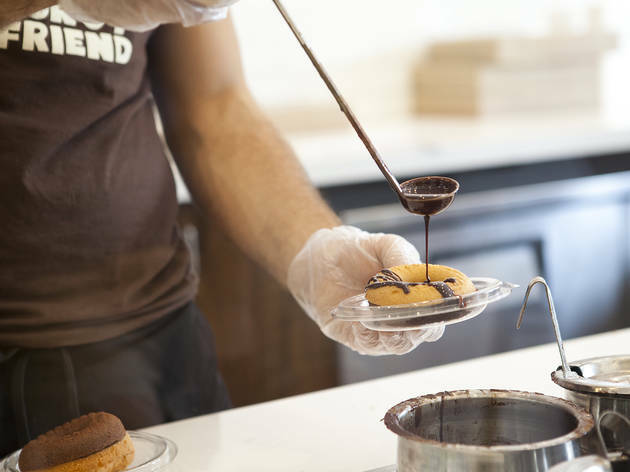 You can customize your own donuts as well, but with options like Coconut of Conformity on the menu, why not venture outside of your comfort zone for a bit? I'm a donut lover. 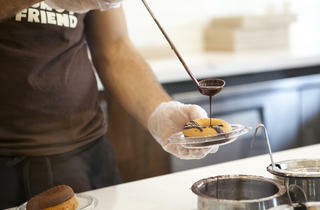 Wherever I go, I search for donuts - whether it's for breakfast, brunch, lunch, dessert, snack, you get the point. I've had Donut Friend at FYF Fest the last two years. Their donuts are always so delicious. This past weekend, I visited their storefront and was blown away by all their options. For starters, I'm not vegan, so I do not go out and search for the best in vegan cuisine, but that does not mean that I will not partake in such a meal. Secondly, I'm not allergic to gluten so I don't opt for the gluten-free options. 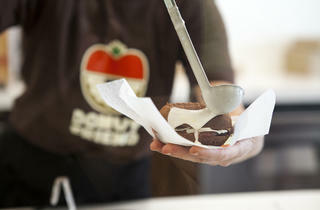 DF offers both options in their donuts and they're the absolute best. I've had their S'Morrissey, Husker Blu, Green Teagan and Sara, Bacon 182 (vegan, of course), Fudgegazi, Joyce Lavender, the list continues. All these donuts have amazing flavors with delicious ingredients. 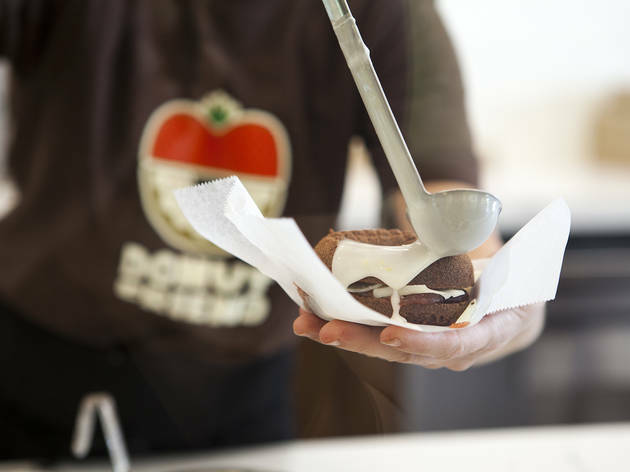 The cake donuts are not dry or dense as one might expect from a dessert without fatty animal products; they're in fact the opposite. So moist. Very delicious! I dare any non-vegan donut lover to try them and say otherwise. 5 stars without question. 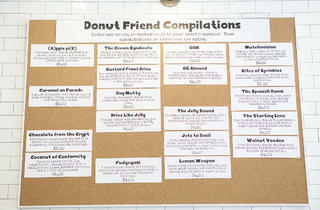 Delicious donuts AND punny names based on pop-punk/emo bands? I am in heaven. This place is phenomenal. 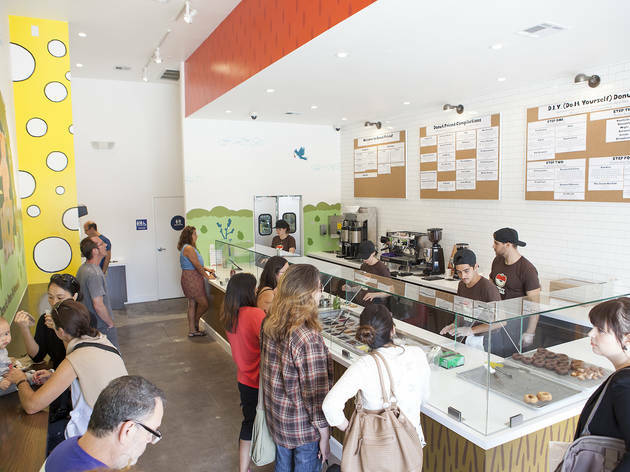 The list of available donuts is as wide as it is delicious -- coffee donuts, donuts stuff with cookie butter or fudge, donuts sandwiches with ice cream, etc. Highland Park might be a bit of a drive for some, but these donuts & all their fun music names/ties are definitely worth it. It's hard to step in without wanting to leave with a box full of them. Although you can find a decent donut anywhere, and Colorado Donuts may start to rival Donut Friend when it comes to the unique, nothing can compare to the winning combination that Donut Friend produces! I find myself craving their Everything Donut, which is like if an everything bagel and a donut had a baby. 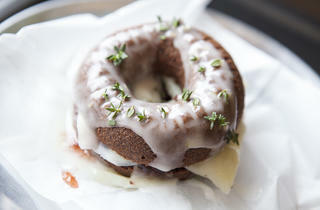 A salty and sweet and delicious donut baby love child. 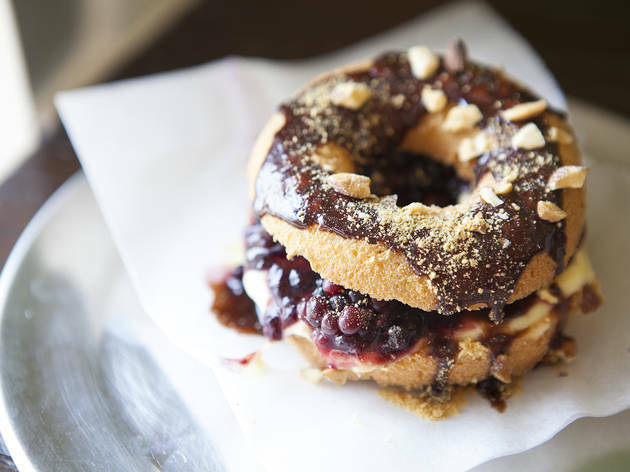 I like that they are always coming up with something new, and I respect that they have plenty of gluten free options that are just as creative and delicious as gluten full donuts! 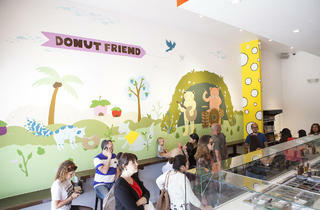 The only down side is that Donut Friend is no longer a delicious secret, the word is out and the people show up! So if you are going after work, even as late as 9 at night (especially on a weekend) you're probably going to meet a line, good news is that the lines tend to go fast, and hey..there's a donut at the end of it for ya! I'm obsessed with this place! Donut Friend, you're the best. I usually hate myself after having donuts from here, but I don't regret it too much. Their lemon frosted donuts are pretty bomb, as is their Jets to Basil donut. 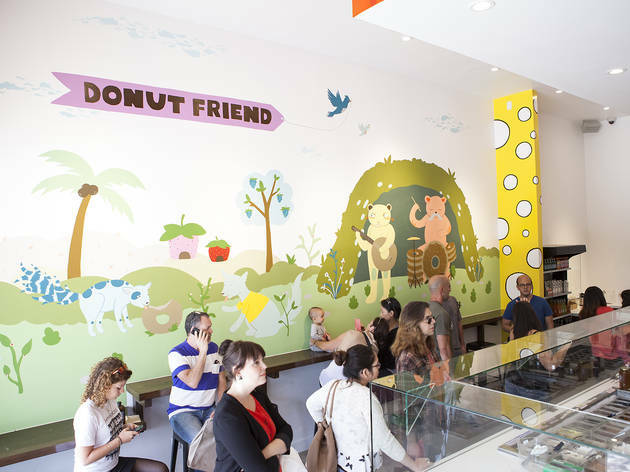 There's no better place for extravagant donuts than Donut Friend. The only downside to this place is it's not good for your health to try a new donut each time you go back and get your favorite. I can't beat the X-Ray Speculoos as my favorite, but there are so many I've yet to try! The Dead Milkbun is perfect for a hot day. I'd love to make my own as well, but again, their biggest hits are so good I'm almost afraid to disappoint myself. I'll admit I've made the trip to Eagle Rock/Highland Park from East Hollywood SOLELY for a donut. second to dough in new york, this is my fav donut place. i love their punny donut names (bob's burgers, anyone?) but my favorite thing about these donuts is that they're not overwhelmingly sweet. the dough is light and airy and even though there can be a lot of flavors on one donut, i don't feel disgusting or like homer simpson in a muumuu afterwards. as a donut snob, i do feel a bit strange about a donut that's sandwiched with fillings rather than injected but these unique treats make me shrug that off cos who cares? they're delicious. YUMMM! 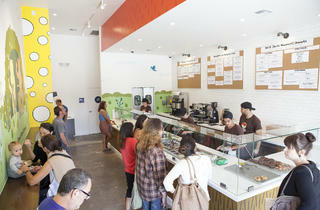 This place is the best—super inventive, always fresh and always fun. The Jets to Basil donut just might be my favorite food ever. 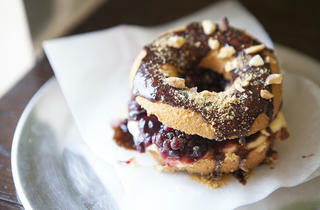 These bad boys are more like dessert sandwiches than donuts, and you can't go wrong. But really, get the Jets to Basil.